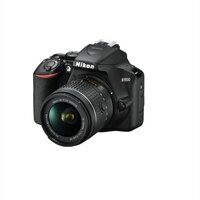 Nikon D3500 - Digital camera - SLR - 24.2 MP - APS-C - 1080p / 60 fps - 3x optical zoom AF-P DX 18-55mm VR lens - BluetoothYou don't need to be a photographer to know a great photo when you see one. And you don't need to be a photographer to take a great photo - you just need the D3500. It's compact, durable and versatile, ideal for travel. And it works seamlessly with compatible smartphones, making it easier than ever to share your great photos.